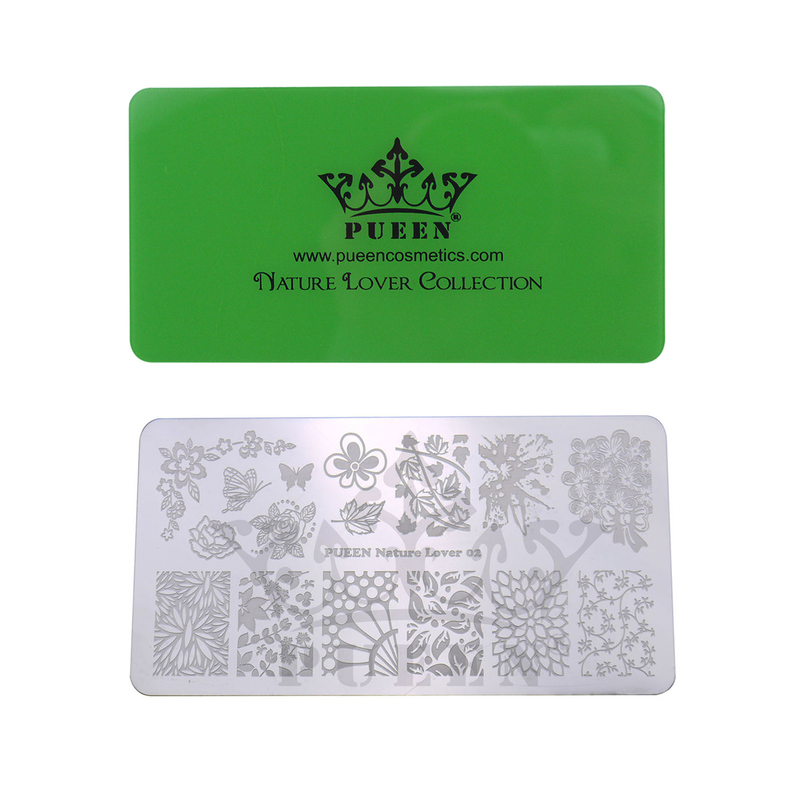 Lacquer Lockdown: Hot Off The Stamping Press: Pueen Lover II Nail Art Stamping Plate Collection! 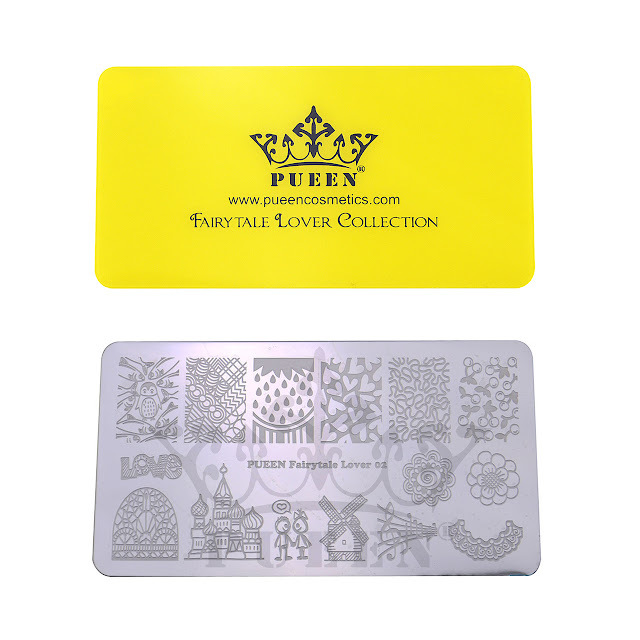 Hot Off The Stamping Press: Pueen Lover II Nail Art Stamping Plate Collection! I know I am so far behind in plate press releases that its gonna be a task to catch up. I'm gonna post up a few today so you see what's out there or rather what's been out there ;) This post is dedicated to the last released from Pueen Cosmetics Lover II Collection. The reviews for these plates seemed to be popping up everywhere. I will say in general it's been my experience with Pueen that their plates are very high quality with regard to etching and seem to offer a variety of images. The last few releases haven't really hit it out of the ballpark for me with regard to innovation, but I can appreciate the solid framework with which these collections are designed. So let's take a look! These plates can be purchased individually or as a set. If you are interested in more than 2 its definitely a little more economical to get the set even if you sell off ones you are less interested in. Ok so this is the Fancy Lover 02 plate. There are about 6 absolutely original images here and the rest are either similar patterns I've seen on a variety of Geometric/Magic Eye style plates or exact dupes of lace patterns an abstracts I have also seen.One abstract in particular strikes me as an absolute dupe from Moyra and Chez Delaney plates. But since about half the plate is pretty original for me this one is decently wishlistable. If you don't have any of these plates this one may be for you. I like that dry marble clover image in particular. Fairytail Lover 02. Images very reminiscent of the MoYou London Tourist, Pro, and Gothic Collections. Its to the degree I'm a little alarmed. The only image that I think is absolutely adorable and novel here are the cherries. I also see one image I've seen before on the old Handy plates. This one is a hard pass for me. When the first set of Lover's plates released I remember thinking clearly that the floral plate was the most original. This is probably still true for the second set though the roses and bottom 2 images from the right I've seen on many other plates. I'm pretty impressed by this butterfly wing since I've never seen one quite like it before. I also like the smaller accent flowers. Overall this is a generally interesting plate. Geo Lover 2 - I'll take the stars and that's about all. For myself this is another plate that has a lot of repeated images. The cascading flowers I recall from a MJ Jr plate, the tiles from MYL, FUN. Plaid on 1 million other plates, herring bone same, and that image of the kaleidoscopic looking shatter UC, BBF, MM, and a few others. So...lol I'm sure people think I'm harsh here. I'm not but sometimes pointing out similar patterns on plates keeps us from needlessly spending especially if we already own it in our collection. Hell I'm guilty of buying plates even when I already have images solely for 1 or 2 images. So you can definitely do the same! However its also true that these days I tend to buy plates with images I don't own or that are solely unique. The great aspect of these plates is that they are generally affordable clocking in at $4.99 USD per plate or $18.99 per collection. Pueen in my estimation has some of the best etching quality of the mainline plate brands and does offer free shipping at the threshold of $28 USD. So if you've been building a wishlist and have a few of these on there that's a good way to scoop them. I'm not sure of any existing codes at the moment, but occasionally they do run sales. Anyhoo these plates are available on the Pueen webstore already. Scoop them if you will and happy hunting. Thanks for reading and I'll see you next post!